afrol News - Racist song "part of South Africa's heritage"
� 13.07.2010 - Zimbabweans flee SA "xenophobia rumour"
Racist song "part of South Africa's heritage"
afrol News, 29 March - Singing of the song "Kill the Boer; Kill the farmer" in public by ruling ANC officials in South Africa has caused a public debate. While a court holds the song incites racist violence, the ruling party and trade union say it is "part of South Africa's heritage." The old song, which had kept up morals among South Africa's black minority during the brutal apartheid regime, was brought up again by Julius Malema, the infamous leader of the ruling ANC party's Youth League. Mr Malema, who is at war with the media, the white minority and feminists, is steadily dominating South African headlines with his radical announcements. But he had never caused as much outrage as when singing the "Kill the farmer" song. Not only white farmers failed to see the humour in the song in a time when an average of two white farmers is killed every week in the country. Since the end of apartheid in 1994, an estimated 2,500 white South African farmers have been murdered - only last year, 120 were killed. On Friday then, the South African High Court ruled that it is illegal and unconstitutional to sing the song because it incites violence. From now, it is a criminal offence to sing the old ANC struggle song. The ANC and its allied trade union COSATU have reacted negatively to the ruling. President Jacob Zuma said the song should be considered "harmless" as it forms part of the ANC's historic struggle against apartheid and thus should not be taken literarily. COSATU today has published an ample defence of the song, comparing it to the Marseillaise, the French national anthem. Just like "Kill the Boer; Kill the farmer", the words of the Marseillaise "can be interpreted as an incitement to murder, yet they are routinely sung at state functions and sporting events. No-one would suggest that it should be banned on the grounds that people might take it literally. It is part of France�s national heritage," COSATU spokesman Patrick Craven says. "South Africa's struggle heritage and culture is part of our history, and it would be extremely dangerous for the courts to decide what songs South Africans can be allowed to sing and banning those they object to," Mr Craven says. "The appropriateness of songs is something that should be subject to a political discussion and not settled in the courts," he adds. But South Africa's two main opposition parties, DA and COPE, have welcomed the banning of "Kill the Boer; Kill the farmer". COPES' Phillip Dexter in a statement today says the argumentation of ANC and COSATU is totally wrong. "The argument of the ruling party that this phrase is part of struggle heritage is revisionist. The vast majority of the songs of the struggle are hymns and songs of upliftment and solidarity, but such songs do not fit the populist agenda of the ANC in their quest to further divide the people of South Africa," Mr Dexter says. The song was nothing else than "hate speech", he adds. Athol Trollip of the Democratic Alliance (DA) reminded the ANC that South Africa's "bloody history" had left "a legacy of emotional scars and deep seated resentment." Those emotions were borne "by almost all communities," including the white minority. The fact that President Zuma was not "prepared to castigate Malema for scratching open these scars and actually inciting violence is alarming," Mr Trollip added. 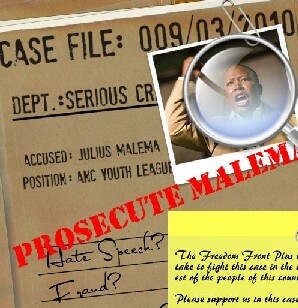 The Boer party Vryheidsfront Plus, representing some of the white farmers, used the occasion to launch a petition to "prosecute Malema" for hate speech, fraud and tax evasion. The petition was attacked by the ANC as posing a threat to Mr Malema's security. But for now, the Vryheidsfront has reached its first goal - to ban the signing of "Kill the Boer; Kill the farmer".